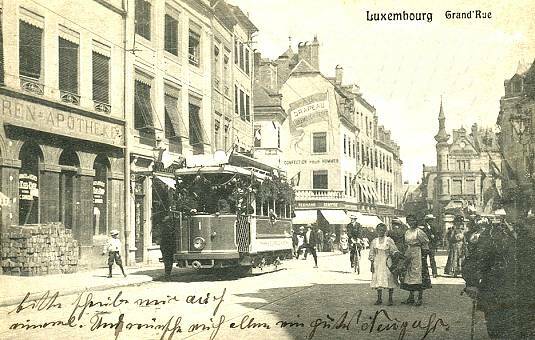 A horse-drawn tram service started on 22 February 1875 in the city of Luxembourg and operated a modest, standard gauge, single route of about 10km from the Central station. It ran a convoluted route through the city centre to the northern district of Limpertsberg. This was replaced by a metre-gauge electric tramway that was inaugurated at 2pm on Saturday 8 August 1908. Our postcard shows tram number 1 at the eastern end of Grand Rue decorated for the occasion and ready to set off westwards for its first official journey. Immediately behind the tram is the junction with Cote d'Eich (to the left) and Rue du Fossé (out of view to the right). With one exception, all the buildings in the view have been replaced or modernised such that none are recognisable from this picture today. However, the spired building in the background does still exist and is currently (2019) a branch of the BGL BNP Paribas Bank. The small road to the left of it is Rue du Palais de Justice. The card, published by Charles Bernhoft of Luxembourg, was posted to an address in New York in December 1910, over two years after the trams started running. The writer wishes his friend a 'happy new year' but makes no mention of the trams. The Luxembourg tramway had nine routes at its maximum, including a long one (route 10) to the northern suburb of Heisdorf. The first series of trams, 1-6, were built by Uerdingen in Germany with electrical equipment by Siemens. Similar cars 7-10 arrived in 1909. In the 1920s and 1930s, the tramway was extended and more modern trams purchased. There was extensive trailer operation with, ultimately, almost as many trailers as motor cars in the fleet. 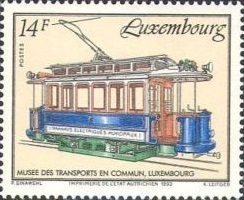 Livery was an attractive blue and cream as shown on a 14 Franc postage stamp (left) issued in 1993 to commemorate the local transport museum which has several trams on display. Along the cream rocker panels of the older trams was the legend "Tramways Electriques Municipaux" with the tram number before after these words, but also on the dash as usual. The tramway closed on 5 September 1964 but, since December 2017, a second-generation standard-gauge tramway has been running over about a 5-mile section in the north of the city which, by 2021, will be extended to connect the airport (in the north-east) with Cloche d'Or (in the south-west), via the city centre. Services are operated with Spanish-built CAF Urbos3 trams.